Following a successful West End debut in The Woman in White at the Palace Theatre, Zoe continues to delight and impress audiences with notable performances. (at the time of the interview) She is currently starring as Nessarose in Wicked at the Apollo Victoria Theatre, London. 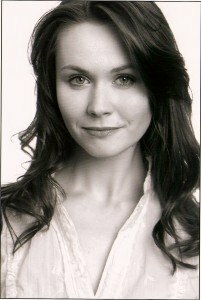 She joined the cast of Wicked in February 2011, following a very successful year as Amber Von Tussle in the musical Hairspray, at the Shaftesbury Theatre. Last week I went along to see Wicked and was very impressed with Zoe’s performance as Nessarose. Together with first class acting, Zoe’s facial expressions and body language are superb throughout and during the early scenes I couldn’t help but feel the passion that Nessarose has for life. The scenes with her sister Elphaba (Rachel Tucker) work extremely well and the dynamics between the two are superb. Together with Rachel and Louise Dearman as Glinda, Zoe’s portrayal of Nessarose is excellent. I recently asked Zoe some questions about herself , Wicked and her career, I hope you enjoy reading about what she had to say. When you first went to McMaster Stage School and The Ulster Theatre Company, did you have an actress or actor that you admired or a character in a musical that you wanted to be? I guess Judy Garland was a huge influence when I was growing up and all the movies of her time. I used to watch Easter Parade over and over again and I still love it. Doris Day was another inspiration. Where was your first professional stage performance? I played Gretel in Hansel and Gretel when I was 7. Apparently my sister was auditioning and I went along with my mum to keep her company and they got me to audition. That’s where it all began. What was it like when you made your West debut in The Woman in White at the Palace Theatre? It was an incredible feeling. For starters the Palace Theatre is the most beautiful theatre and the gorgeous orchestration of The Woman in White just added to the excitement. It was literally a dream come true. You played Amber Von Tussle, “the spiteful, shallow teenage daughter” in Hairspray, what did you focus on in order to create the character’s personality? I think mostly I focused on why she was all of the above. She was a victim of her circumstances and upbringing so I wanted people to understand why she behaved the way she did. Mean Girls the movie helped too! You are now performing as Nessarose in Wicked The Musical. What is it about the show that makes it so successful? The show has all the components needed to be successful. Its score is beautifully written and the book is detailed in ways that we don’t even realise when we watch it. Every second of the show has a reason and an emotion. The characters make you invest in their story and the little references to the Wizard of Oz help non-theatregoers stay interested. The songs are some of the best in the history of musical theatre. How would you describe ’your’ character of Nessarose, and her relationship with Elphaba and Boq? Well Nessa deals with a lot in her life due to her disability and relies on Elphaba a great deal. They seem to still have a loving relationship and Elphaba is happy to take care of her sister. Her love for Boq is intense. She has never felt these feelings before and sometimes her actions are misinterpreted because of her lack of experience and fear of losing him. She’s a very kind girl but I do think she is also a little spoilt due to Daddy’s behaviour and treatment. What is your favourite song from Wicked? My favourite song in Wicked changes every time I get asked this because I love so many of them but I think it has to be “I’m Not That Girl”. A Beautiful and vulnerable song. And I love when in the 2nd Act it segues into As Long As You’re Mine. Genius. If you could magically be transported from Wicked for one night to perform as one of the characters in The Wizard of Oz, who would it be? It would have to be Dorothy. I played Dorothy when I was 17 and she was one of my favourite characters. I think with Judy Garland being my main influence and inspiration it would only be right to want to play her most iconic role. Other than in Wicked, is there a role that you would love to play sometime in the future, or a show that you would really like to be in? I would love to play Kate Monster in Avenue Q. Who would you most like to star alongside? I would love to act opposite Sally Field. She’s a legend and I would learn so much from watching her. As well as a celebrated actress, you are also a recording artist, what has been the highlight of this aspect of your career? Recording the Parade album was one of the highlights for me. We were so lucky to be given the opportunity to record it and with such a wonderful company it was a pleasure. I wish I recorded more because I could spend every day in a recording studio as I enjoy it that much. Looking ahead, what would you like the future to hold for you? Well I love working so if I can continue to keep busy with exciting projects I would be delighted. I would love to be a regular in a drama to experience that side of it. I get paid to do what I love so as long as it continues I’m happy. Thank you for your support and commitment to the show and the cast. It’s lovely to hear that you come to theatre for two and a half hours and enjoy yourselves, and forget whatever the day has brought you. As long as you continue to be moved by theatre then we’re doing something right. Thanks Zoe! We wish you the very best as Nessarose in Wicked and may all your dreams come true in the future! ‘Nessarose’ in Wicked (Apollo Victoria Theatre), ‘Yvonne’ in Sunshine on Leith (Dundee Rep and UK Tour); ‘Amber Von Tussle’ in Hairspray (Shaftesbury Theatre); u/s ‘Gigi’ in Gigi (Regent’s Park); ‘Maria’ in The Sound of Music (Larnaca Festival); ‘Monteen’ in Parade (Donmar Warehouse); u/s ‘Sarah Brown’ in Guys and Dolls (UK Tour); ‘Manon’ in Jean de Florette (The Venue); u/s ‘Laura Fairlie’ in Woman in White (Palace Theatre); ‘Beth March’ in Little Women (Theatre Royal, Drury Lane); Ensemble in Jekyll and Hyde (UK Tour); ‘Marie’ in Warcrime Tribunal (Pleasance and Underground Theatre). Recordings include: Michael Ball’s Past and Present Album (Hairspray Cast); Parade (Donmar Warehouse); True Colours (Bombardier Aerospace); It’s 1995, Song for Peace (Dave Glover).